DermaLife Spa Jet is a multi-sensory spa treatment system that is truly a holistic system of balance and restoration creating a revolutionary improvement for spa and skin care treatments. DermaLife Spa Jet combines natural elements of aromatherapy, chromotherapy, hydrotherapy, heat therapy, massage therapy and topical herbal and nutritional therapy balance. The synergy of non-invasive, natural therapies and the methods used in Dermalife Multi-Sensory Spa Systems quickly restores the vitality of the body and mind paving the way to a new, positive and healthy way of living. 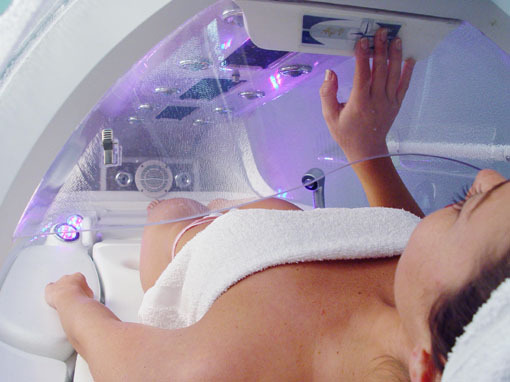 Hydrofusion: This treatment combines infrared heat and steam. Increased body temperature causes the skin to perspire to keep the core temperature stable (thermogenesis), which enhances cleansing and detoxification. It also increases oxygen supply to the blood and tissues, resulting in improved skin nutrition and rejuvenation. Together, these elements join forces to optimize detoxification, moisturizing, and the penetration of nutrients for advanced skin care. Herbs and essential oils infused into steam enhance the results. The infrared heat is in tune with our own energy system. Research indicates that infrared penetrates the skin layers more deeply and helps increase blood and Iymphatic circulation. The Vitamin-Mineral System of the spa topically dispenses nutrients like vitamins and minerals into the mist stream allowing skin to transdermally drink up the nourishment and protection of powerful anti-oxidant vitamins and minerals. The mist system has the same benefits as the therapeutic effects of a mineral springs bath. The Vibratory Massage Bed engages all of the body's systems to work in unison toward the goal of systemic harmony. Cradling the body, the ergonomically-designed support bed features a patented massage vibration system featuring continuous and pulsating vibration to stimulate the body. Two massager jets at the feet revive and refresh aching feet. The Aromatherapy System offers two unique reservoirs that vaporize aromatherapy and herbal extracts to awaken olfactory senses and influence emotions and the mind in a positive, relaxing way. Pure essential oils and herbal essences stimulate the body both through the sense of smell and through their ability to permeate the skin. Chromotherapy: State-of-the-art digital lighting technology (LED's) and four strategically located chromotherapy light stations generate a variety of rich and atmospheric colored lights. Our bodies react to color in quantifiable, physiological ways. By combining color with other spa treatments, effects are enhanced. Each one of the Spa Jet's pre-set programs features a different Colorbath with random color changes and multicolor cross fades made up of all the colors of the spectrum, from soothing and relaxing, to balancing and energizing. DermaLife Spa treatments can be used with many different holistic products. A typical treatment features all natural exfoliating creams/gels, salt glows, body wraps, seaweed masks, toning and moisturizing gels/creams to detoxify, nourish, revitalize and protect the skin. Hot/Cold Water treatments, promoted by the famous Father Sebastian Kneipp, a passionate hydrotherapy pioneer and supporter, uses hot/cold "Scottish Shower" techniques to stimulate circulation, detoxify, soothe and invigorate the body. This has become a favorite hydrotherapy service in many exclusive and high-end spas. Dermalife Spa Jet takes the hydrotherapy experience to new and sophisticated levels by combining water-based therapies to help stimulate, energize and soothe a variety of ailments like rheumatism and arthritis as well as speed the healing of injuries. Weight Loss/Detoxification/Cellulite: Effective cellulite reduction and slimming can only be performed by vigorously increasing circulation, stimulating metabolism, detoxifying and eliminating excess fluids. Used in conjunction with products containing cellulite-fighting ingredients, Dermalifeª is a vital link in obtaining the results you are looking for. Re-Mineralizing/Moisturizing/Hydrating: Body wraps and mask treatments begin by eliminating impurities through exfoliation and products containing essential oils, herbs, muds, clays, seaweed and algae. These natural ingredients are rich in vitamins and minerals and help replenish lost nutrients in dry, damaged or aging skin. With the added boost of an effective heat and hydrotherapy treatment, these products will leave even the most damaged skin fresher, cleaner, more hydrated and glowing with health. Anti-aging: The skin is our body's largest organ. Healthy skin acts as a protective envelope for the body and is vital in maintaining overall health and beauty. 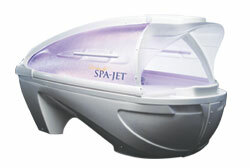 Anti-aging treatments are dramatically enhanced with the DermaLife Spa Jet. Hydrofusion stimulates the development of collagen, creating a soft, youthful skin texture. By combining the relaxing, steady warmth and stimulating hydrotherapy experience with seaweed or mud applications, the absorption of the anti-aging and detoxifying ingredients are greatly increased, leaving the skin supple and glowing. Mention this article and you will receive a special discount on DermaLife SpaJet treatments offered by KFW The Spa 4 Skin, a full-service skin treatment spa offering a variety of services. KFW The Spa for Skin is located at 60 Lorraine Court, Holbrook, NY 11741. For more info call (631) 737-2070.